Lama Thubten Yeshe was born in Tibet in 1935 not far from Lhasa in the town of Tölung Dechen. Two hours away by horse was the Chi-me Lung Gompa, home for about 100 nuns of the Gelug tradition. It had been a few years since their learned abbess and guru had passed away when Nenung Pawo Rinpoche, a Kagyü lama widely famed for his psychic powers, came by their convent. They approached him and asked, “Where is our guru now?” He answered that in a nearby village there was a boy born at such and such a time, and if they investigated they would discover that he was their incarnated abbess. Following his advice they found the young Lama Yeshe to whom they brought many offerings and gave the name Thondrub Dorje. Afterwards the nuns would often take the young boy back to their convent to attend the various ceremonies and other religious functions held there. During these visits—which would sometimes last for days at a time—he often stayed in their shrine room and attended services with them. The nuns would also frequently visit him at his parents’ home where he was taught the alphabet, grammar and reading by his uncle, Ngawang Norbu, a student geshe from Sera Monastery. Even though the young boy loved his parents very much, he felt that their existence was full of suffering and did not want to live as they did. From a very early age he expressed the desire to lead a religious life. Whenever a monk would visit their home, he would beg to leave with him and join a monastery. Finally, when he was six years old, he received his parents’ permission to join Sera Je, a college at one of the three great Gelug monastic centers located in the vicinity of Lhasa. He was taken there by his uncle, who promised the young boy’s mother that he would take good care of him. The nuns offered him robes and the other necessities of life he required at Sera, while the uncle supervised him strictly and made him study very hard. He stayed at Sera until he was twenty-five years old. There he received spiritual instruction based on the educational traditions brought from India to Tibet over a thousand years ago. From Kyabje Trijang Rinpoche, the Junior Tutor of His Holiness the Dalai Lama, he received teachings on the Lam-rim graded course to enlightenment which outlines the entire sutra path to buddhahood. In addition he received many tantric initiations and discourses from both the Junior Tutor and the Senior Tutor, Kyabje Ling Rinpoche, as well as from Drag-ri Dorje-chang Rinpoche, Song Rinpoche, Lhatzün Dorje-chang Rinpoche and many other great gurus and meditation masters. Such tantric teachings as Lama Yeshe received provide a powerful and speedy path to the attainment of a fully awakened and purified mind, aspects of which are represented by a wide variety of tantric deities. Some of the meditational deities into whose practice Lama Yeshe was initiated were Heruka, Vajrabhairava and Guhyasamaja, representing respectively the compassion, wisdom and skilful means of a fully enlightened being. In addition, he studied the famous six yogas of Naropa, following a commentary based on the personal experiences of Je Tsongkhapa. Among the other teachers who guided his spiritual development were Geshe Thubten Wangchug Rinpoche, Geshe Lhundrub Sopa Rinpoche, Geshe Rabten and Geshe Ngawang Gedun. At the age of eight he was ordained as a novice monk by the venerable Purchog Jampa Rinpoche. During all this training one of Lama Yeshe’s recurring prayers was to be able some day to bring the peaceful benefits of spiritual practice to those beings ignorant of the dharma. This phase of his education came to an end in 1959. As Lama Yeshe himself has said, “In that year the Chinese kindly told us that it was time to leave Tibet and meet the outside world.” Escaping through Bhutan, he eventually reached Northeast India where he met up with many other Tibetan refugees. At the Tibetan settlement camp of Buxaduar he continued his studies from where they had been interrupted. While in Tibet he had already received instruction in prajnaparamita (the perfection of wisdom), Madhyamika philosophy (the middle way) and logic. In India his education proceeded with courses in the vinaya rules of discipline and the abhidharma system of metaphysics. In addition, the great bodhisattva Tenzin Gyaltsen, the Kunu Lama, gave him teachings on Shantideva’s Bodhisattvacat yavatara (Guide to the Bodhisattva’s Way of Life) and Atisha’s Bodhipathapradipa (Lamp of the Path to Enlightenment). 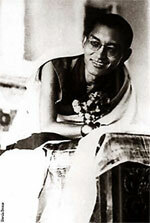 He also attended additional tantric initiations and discourses and, at the age of twenty eight, received full monk’s ordination from Kyabje Ling Rinpoche. 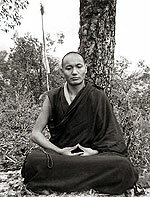 One of Lama Yeshe’s gurus in both Tibet and Buxaduar was Geshe Rabten, a highly learned practitioner famous for his single-minded concentration and powers of logic. This compassionate guru had a disciple named Thubten Zopa Rinpoche and, at Geshe Rabten’s suggestion, Zopa Rinpoche began to receive additional instruction from Lama Yeshe. Zopa Rinpoche was a young boy at the time and the servant caring for him wanted very much to entrust him permanently to Lama Yeshe. Upon consultation with Kyabje Trijang Rinpoche, this arrangement was decided upon and they have been together ever since. Lama Thubten Zopa Rinpoche was born in 1946 in the village of Thami in the Solo Khumbu region of Nepal near Mount Everest. From the house where he was born he could look up the mountain side and see Lawudo, where the cave of the late Lawudo Lama was situated. While his predecessor had belonged to the Sakya tradition of Tibetan Buddhism, the Lawudo Lama himself had been a great master of the complete tantric teachings of the Nyingma tradition. For the last twenty years of his life he had lived in his cave, attended by his wife and two children, and had spent all his time either meditating or giving teachings and spiritual advice to the people of the Solo Khumbu and neighboring regions. His energy on behalf of all beings was inexhaustible and it is said that in his later years he passed completely beyond the need for sleep. From the time he was able to crawl, Zopa Rinpoche would spend most of his time trying to climb the steep path leading to the cave of this deceased lama. Time and again his family would have to retrieve him forcefully from the precarious route he was intent on traveling and make him return reluctantly to his home. Finally, when he was old enough to speak, he declared that the cave was his and that he was the incarnation of the Lawudo Lama. He further insisted that his only desire was to lead a life of meditation. When he was four or five years old, his claim to be an incarnate lama was subjected to public examination by Ngawang Samden, a Nyingma master meditator who lived nearby. When the young boy was repeatedly able to identify possessions belonging to the Lawudo Lama and pass other rigorous tests, he was formally declared to be the rightful incarnation and received the full investiture of the Nyingma tradition. Later he was to receive the tantric initiations of this tradition from the head lama of the Thami Gompa, known affectionately as Gaga (or Grandfather) Lama. Young Zopa Rinpoche began his education at Solo Khumbu in the traditional Tibetan manner, with the alphabet. One of the first books he read was the biography of Milarepa, the famous eleventh century poet and meditator. This work sparked in him a great desire to become like Milarepa and study under such a highly realized lama as Marpa, Milarepa’s root guru. He also heard of the Mindrol Ling Monastery in Tibet, the famous centre preserving and transmitting all the Nyingma teachings and initiations, and wanted very much to go there to pursue his spiritual training. While still a young boy, Zopa Rinpoche was taken on his uncle’s back for a pilgrimage to Tibet. When he arrived north of Sikkim at the Dung-kar Monastery of Domo Geshe Rinpoche, he startled his uncle by declaring that he had no intention of returning home with him. Rather, he wanted to stay at this monastery and devote his life to studying and practicing the dharma. The uncle was very upset because the young rinpoche was his responsibility, but when the commissioner of the area decided that the child’s wishes should be honored, there was nothing left for him to do but return to Nepal empty-handed. The monks at Dung-kar had no reason to believe that this young boy from a remote region of Nepal was an incarnate lama, but upon consultation with their guardian dharma protector, his claim was confirmed. From that time onwards his diet was kept free of those foods considered unclean. His education would have continued at Sera Je in Lhasa, but these plans were also interrupted in 1959. Eventually he found his way to Buxaduar where he first became the disciple of Geshe Rabten and then of Lama Yeshe as described above. Lama Yeshe and Zopa Rinpoche’s contact with Westerners began in 1965 while they were visiting the Ghoom Monastery in Darjeeling. One day a monk came to their room and said that a friend had come looking for them. It was an American woman, Zina Rachevsky, who had actually come in search of Demo Geshe Rinpoche, but because Zopa Rinpoche had been known as Demo Rinpoche ever since his stay at Dung-kar, she mistakenly believed him to be the lama she had in mind. From this unusual first meeting a strong friendship grew, and the lamas spent nearly a year teaching at her home before Zina had to leave Darjeeling for Ceylon. She then wrote many letters to His Holiness the Dalai Lama entreating him to permit the lamas to join her. When permission was granted she returned to India and the three of them visited the Dalai Lama in Dharamsala. There Zina was ordained as a novice nun. In 1967 the two lamas and their newly ordained disciple left India, not for Ceylon as originally planned, but for Nepal. The three at first resided near the Boudhanath stupa several miles from Kathmandu. After a few years, however, they were able to purchase land at the top of a nearby hill called Kopan. 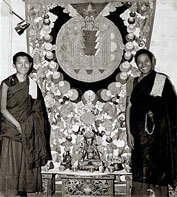 There they founded the Nepal Mahayana Gompa Center in 1969. The main building was constructed in 1971-2, funded almost exclusively by the lamas’ increasing number of Western disciples. When the first meditation course was given there in 1971, it was attended by about twenty students. By the time of the seventh course, held in the autumn of 1974, interest was so great that attendance had to be restricted to 200 meditators, the limit of the local facilities. In December of 1973 Kopan became the home of the International Mahayana Institute, an organization composed of Western monks and nuns. This fledgling sangha, which at present numbers nearly thirty disciples, follows a schedule of work, study and meditational retreat designed to help them fully devote their lives to the dharma. They also publish teachings and translations prepared by the lamas and organize group and individual retreat facilities for interested meditators from all religious denominations . Kopan is not the only site where the lamas have tried to provide a conducive atmosphere for actualizing the dharma. In 1972 they purchased land in Dharamsala, the North Indian hill station that for many years has been the headquarters of His Holiness the Dalai Lama, and since 1971 the site of the Library of Tibetan Works and Archives. In a house formerly belonging to Kyabje Trijang Rinpoche, they established Tushita Retreat Center. Here many serious students from the Kopan meditation courses, the Dharamsala Library classes and other centers have come to use the ever-expanding retreat facilities to advance their spiritual practice. Nor are Westerners the only ones who have benefited from the lamas’ compassion, concern and energy. Lama Thubten Zopa Rinpoche’s predecessor had been requested by the Tibetan and Sherpa people of Solo Khumbu to build a monastery near the site of his meditation cave. He declined, excusing himself because of old age, but promised to establish such a monastery for these people in his next life. When Lama Thubten Zopa Rinpoche returned to Nepal in 1967 he decided to honor this commitment made by the previous Lawudo Lama. At that time he was advised by the late lama Lozang Tsültrim, the abbot of a nearby monastery, “not to have a small mind, but build the new monastery as large as possible.” Donations by interested Westerners and the Tibetan and Sherpa people of the area enabled work to begin on this project in 1971. In the following year the Mount Everest Center for Buddhist Studies at Lawudo was opened for residence. Attending this center are the incarnations of several great lamas such as Lama Yeshe’s guru, Geshe Ngawang Gedun of Sera. And soon the young incarnation of Lama Lozang Tsültrim himself will attend. At present there are fifty children receiving a closely supervised monastic education that includes not only traditional Buddhist studies, but classes in Nepali, English, Tibetan, mathematics and art as well. These monks are mostly Sherpas aged five to nineteen. It is hoped that eventually the Mount Everest Center will be able to accommodate 200 students and provide for both their spiritual and physical well-being. In establishing the Kopan Gompa near Kathmandu, the Tushita Retreat Center in Dharamsala and the Mount Everest Center at Lawudo, the lamas have been very interested in providing students with an interconnected system of facilities to assist their spiritual practice. Thus when a group of disciples from Australia and Mr. C. T. Shen of the New York-based Institute for the Advanced Study of World Religions invited the lamas to their countries in 1974, this was seen as a perfect opportunity to explore what more could be done to help spiritual seekers.